Environmental problems in China are already at a critical level and they are getting worse. Rapid development has transformed huge swaths of the country into environmental wastelands. Acid rain corrodes the Great Wall; parts of the Grand Canal resemble open sewers; parts of Shanghai are slowly sinking because water beneath them has been sucked out; and some cities are so clogged with air pollution they don't appear in satellite pictures. Reports indicate that only 32 percent of China's industrial waste is treated in any sort of way. Already there are concerns of millions of environmental refugees in China and sulfurous rain clouds drifting from China to Japan and Korea. The major current environmental issues in China are air pollution (greenhouse gases and sulfur dioxide particulates) from overreliance on coal, which produces acid rain; water shortages, particularly in the north; water pollution from untreated wastes; deforestation; an estimated loss of 20 percent of agricultural land since 1949 to soil erosion and economic development; desertification; and illegal trade in endangered species. Deforestation has been a major contributor to China’s most significant natural disaster: flooding. In 1998 some 3,656 people died and 230 million people were affected by flooding. China’s national carbon dioxide emissions are among the highest in the world and increasing annually. The carbon dioxide emissions in 1991 were estimated at 2.4 billion tons; by 2000 that level, according to United Nations (UN) statistics, had increased by 16 percent to nearly 2.8 billion tons. According to the International Energy Agency (IEA), between 1990 and 2002 the increase was closer to 45 percent. These amounts cited by the UN are more than double those of India and Japan but still less than half those of the United States (comparable figures for Russia are unavailable but estimated at probably half the level of China’s). China’s ozone depleting potential also is high but was decreasing in the early twenty-first century. The carbon dioxide emissions are mostly produced by coal-burning energy plants and other coal-burning operations. Better pollution control and billion-dollar cleanup programs have helped reduced the growth rate of industrial pollution. Ma Jun’s Institute of Public and Environmental Affairs has a registry of environmental problems in China. China is the world's biggest greenhouse gas emitter, number one energy user and arguably the most polluted nation on earth. It is home to some of the world’s most polluted rivers and water supplies. Of the 20 dirtiest cities on the globe, 16 are in China, according to the World Bank. Two Chinese cities---Linfen, in the heart of Shanxi Province’s coal country, and Tianying, a lead mining and processing center---made the top 10 on a list of the world’s most polluted cities by the Blacksmith Institute. Three Chinese cities---Tianying, Huaxi and Wanshan---made the top 10 list for cities in the world with the worst pollution by heavy metals. Estimates are that pollution in China will only get worse as China’s 1.3 billion people get richer and buy motorbikes, cars, and air conditioners and travel on airplanes. Increases in emissions and demand for coal might make China’s air 70 percent worse by 2030, according to Deutsche Bank AG. Toxic emissions are slipping into groundwater supplies. A report released in February 2009, stated that decades of heavy use of nitrogen fertilizer have contaminated groundwater supplies, increased acid rain, acidification and greenhouse emissions, The report encourages farmers to change their farming practices and reduced their dependence on synthetic nitrogen fertilizers and use alternatives such as manures and crop residues. Pollution is getting worse but is difficult to tell by how much worse because the government generally doesn't release statistics on pollution and when it does the data is often times of dubious quality. There are lots of environmental laws on the books---at least 230 at last count---but the problem is that they are rarely enforced. Cement factories, steel mills, chemical factories, and coal-fired power plants are among the biggest polluters. Pollution from factories and power plants is rising by 9 percent a year. Pollution from vehicles is rising fast. "China is involved in a race against time," Patrick Tyler wrote in the New York Times, "a race against the rapid depletion of the country's natural resources and the demands of its own population explosion." One Chinese intellectual told Tyler: "China as a whole is weak in ecological stability and society has not realized the seriousness of this problem." "If anybody's economic development is unsustainable, it's China's," one scholar told the Wall Street Journal, "Many people in the top leadership are aware that it's bad to develop and let the environment slip. But their hearts aren't in it." Joseph Kahn and Jim Yardley wrote in the New York Times, “Environmental degradation is now so severe, with such stark domestic and international repercussions, that pollution poses not a major long-term burden to the Chinese public but also an active political challenge to the ruling Communist Party... Public health is reeling. Pollution has made cancer China’s leading cause of death....Only 1 percent of the country’s 560 million city dwellers breath air considered safe.” In industrial cities people rarely see the sun; children become sickened by lead poisoning. Coastal areas and even lakes suffer from red tides; rivers emit fumes that make people feel sick and gives them cancer. The World Bank has calculated that pollution and associated health problems cost China 3 percent of GDP, with water pollution accounting for half of the losses. According to other estimates if sick days and forest and farmland loses are factored in environmental degradation may cost China as much 5 percent or even 10 percent of GNP. If these figures are true then real economic growth in China is between 5 percent and 7 percent not 10 percent and 11 percent. In April 2010, a Chinese coal carrier ran aground off Australia on a shoal in the Great Barrier reef, leaking three tons of oil and pulverizing part of a shoal. Reef scientists said that it could take 20 years for the reef to completely recover. The owners of the ship---Shenzhen Energy Transport---admitted that the ship had strayed off course and apologized for the mishap. Discarded lighters and bottle caps from Japan, Korea and China that floated across the Pacific Ocean to the Midway Islands near Hawaii have been be blamed for killing endangered Laysan albatross chicks that ingested the objects after being given them by their mothers, mistaking them for food. The young birds were unable to digest the plastic and were weakened as a result. Researchers who examined the dead chicks found 80 lighters with Chinese, Japanese and Korean writing inside them. Book: “The Devouring Dragon: How China’s Rise Threatens Our Natural World” by Craig Simons (St. Martin’s Press 2013). Craig Simons is a former Asia correspondent for Cox Newspapers and a former Peace Corps volunteer in China. The number of babies born with birth defects increased from 104.9 in 10,000 births in 2000 to 145.5 in 10,000 births in 2007. Many blame pollution. In September 2009, chemicals from a plastics factory disposed of in an illegal site was blamed for killing three and injuring 17, including four children who played near the site, in the industrial city of Dongynag in Zhejiang Province. Most of the deaths were attributed to contamination by the industrial chemical dinitrophenol. 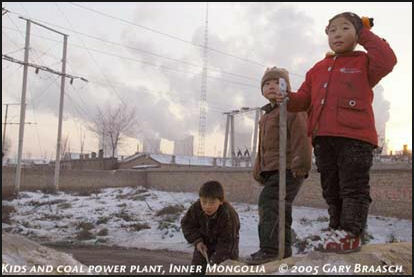 In May 2009, over 1,000 people that lived around the Jilin Chemical Fibre Group plant in Jilin city in northwest China complained of headaches, nausea and other illnesses. A total of 161 were hospitalized. In June 2008, six people were killed and 28 fell ill from toxic gas---hydrogen sulfide--- leaking from a fertilizer plant in Kunming in Yunnan Province southwest China. A study by researchers at Peking University and Oregon State University suggest that if pollution cutbacks implement during the 2008 Olympics were kept in place residents of Beijing would have their risk of getting lung cancer cut in half and 10,000 fewer people would get the disease. The study focused on PAHs (polycyclic aromatic hydrocarbons) that arrive from coal-burning, wood stoves and cars. ‘Ugly’ Sperm Resulting from Pollution in China? Increases in cancer rates of 19 percent in urban areas and 23 percent in rural area have been blamed on air and water pollution. The most awful and shameful examples of how bad China’s pollution has become are the so-called cancer villages, where pollution in the water and air is blamed for surges in cancer rates. One such place is Yangqiao, a town in the wetlands of southeastern China that has been so fouled by the waste from chemical plants, the air is acrid and make people dizzy and yellow waste water seeps into irrigation ditches, producing sick dogs, dead fish, stunted crops and high cancer rates. In March 2006, 130 people were hospitalized outside the city of Ningbo in Zhejiang Province in eastern China following a leak of poisonous gas from a chemical plant. Villagers reported seeing a cloud of gas floating across farmland killing crops and poultry and several days later began experiencing dizziness, sore throats, chest pains and skin irritation. Pollution is also blamed for the increase in the number of deformed children in places where pollution levels are high. Babies born with deformities such as cleft palates, neural tube defects, congenital heart disease, water on the brain, and extra fingers and toes is up 6 percent a year nationwide---and 40 percent between 2001 and 2006---with rates much higher in place like the major coal-mining areas of Shanxi Province. Shanxi is home to the world’s three most polluted cities. In addition to coal mining there is pollution from coke, steel and chemical industries. It also lead the world in the incidents of cleft palates and extra fingers among babies. Some parents whose children are born with extra toes cut them off so it is easier to buy shoes. 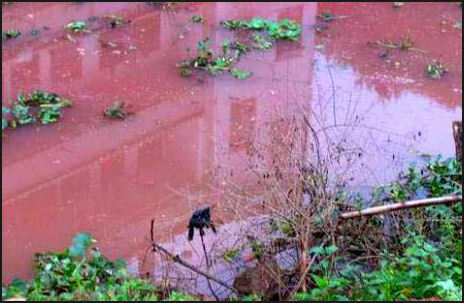 The river that flows through the village of Shangba in Guangdong Province is polluted by heavy metals. It varies in color from murky white to bright orange and is so viscous that it barely moves when winds blow on it. One villager told AP, “All the fish died, even chickens and ducks that drank the water died. If you put your leg in the water, you’ll get rashes and a terrible itch...Last years alone, six people in our villages died from cancer, and they were in their 30s and 40s.” Two girls, who often played in the river died at the ages of 12 and 18 from kidney and stomach cancer, which are rare among you people. The source of much of the pollution is the state-owned Daboshan mine, which produces huge piles of tailing discarded next to rice fields and dumps large amounts of cadmium, a known carcinogen, as well as lead, zinc, indium and other metals into water supplies. Tests have shown high levels of cadmium and zinc in the drinking water and the rice. Stomach, liver kidney and colon cancer account for 85 percent of the cancers acquired by villagers. Even companies that are supposedly helping the environment are notorious polluters. The Luoyamg Zhonggui High-Technology, for example, which operates on the Yellow River in Henan Province, is a major producer polysilicon, a material widely used in solar panels around the world and a major supplier for Suntech, a company founded by one of China’s richest men. The byproduct of polysilicon production is silicon tetrachloride, a highly toxic substance that is loaded on to dump trucks and dumped in corn fields in villages near the factory. Polysilicon is an essential component for solar technology but is tricky to produce. It requires large amounts of energy to make, the smallest amounts of impurities can ruin a batch and for every ton of polysilicon that is produced four tons of silicon tetrachloride is created. In the last few years increased demand for polysilicon has caused the price of the material to jump from $20 a kilogram to $300 kilogram. As the price has risen a number of Chinese companies “supported with venture capital and low-interest loans from the government---have sprung up to meet the demand. The factories require sophisticated technology to make the polysilicon and are supposed to recycle the water they use. The Chinese are racing full bore ahead making polysilicon factories even though they haven’t worked out the trickier elements of making the stuff and disposing of the waste materials. More than 20 new polysilicon factories have opened or are being built. Their capacity is 80,000 to 100,000 tons---more than double the 40,000 tons produced in the entire world today. The problem with this is that these factories will also produce tons of silicon tetrachloride and there are few regulations or punishments to keep it from being irresponsibly dumped by the factories. Tests of fields where the silicon tetrachloride has been dumped show high levels of chlorine and hydrochloric acid which poison the soil and prevent crops from growing.